new in: leather biker jacket. How do you like my latest purchase? 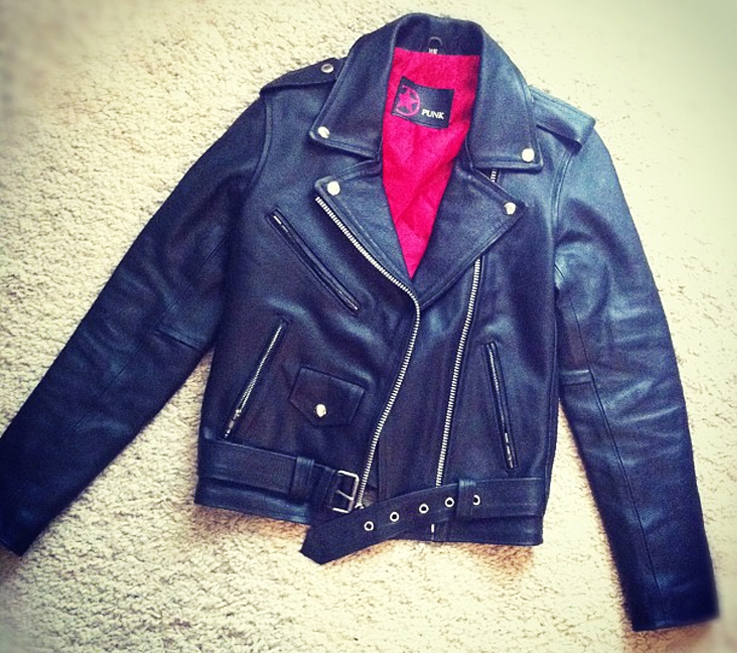 I was searching for a real leather biker jacket for a very long time now and it was so hard to find. Last year I bought the ACNE Rita jacket which was too big unfortunately, so I didn’t keep it. Then last winter I saw a really nice one in a vintage shop in Paris, but I was not willing to pay 160€ for no name. Some days ago I have finally found my perfect black leather biker jacket on eBay! Very similar to the one I saw in Paris but this heavy black beauty only cost 50€. I couldn’t be happier. outfit: love will tear us apart. give-away: 100€ voucher for urban outfitters. That’s indeed a very pretty jacket! Tough but not too heavy for girly outfits. And €50 is a bargain! Ich möchte mal ein Tragebild sehen 🙂 und kannst du mir den Ebayshop sagen, wo du sie gekauft hast ? I think that a leather biker jacket is a must have ! it never comes out of fashion and you can stle it with everything !